Its origin is lost in those days when Jerusalem was restored as a sacred city, at the time of the Roman Emperor Constantine (c. 285-337). By then it had been a pagan city for two centuries, ever since Emperor Hadrian (76-138) had levelled it around the year 135 and rebuilt it as <Aelia Capitolina> in honour of Jupiter. After the building of the Church of the Holy Sepulchre in 336, the sacred sites began to be restored and memories of the life of Our Lord began to be celebrated by the people of Jerusalem. One of the memories about his mother cantered around the "Tomb of Mary," close to Mount Zion, where the early Christian community had lived. For a time, the "Memory of Mary" was marked only in Palestine, but then the emperor to all the churches of the East extended it. In the seventh century, it began to be celebrated in Rome under the title of the "Falling Asleep" ("Dormitio") of the Mother of God. 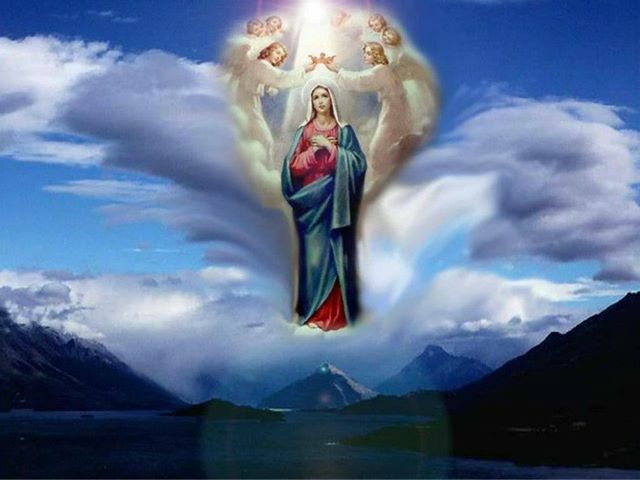 All the feast days of Mary mark the great mysteries of her life and her part in the work of redemption. The central mystery of her life and person is her divine motherhood, celebrated both at Christmas and a week later (Jan. 1) on the feast of the Solemnity of Mary, Mother of God. The Immaculate Conception (Dec. 8) marks the preparation for that motherhood, so that she had the fullness of grace from the first moment of her existence, completely untouched by sin. Her whole being throbbed with divine life from the very beginning, readying her for the exalted role of mother of the Saviour.